Balfour addresses the Georgia Senate after the body convened for the 2014 legislative session. 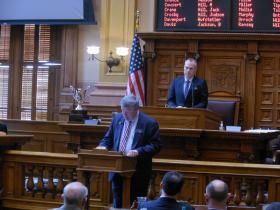 Monday was the first day of the 2014 Georgia legislative session. During day one, Gwinnett County Republican Senator Don Balfour took the opportunity to address the Senate for the first time since being reinstated. Balfour was recently found not guilty on 18 felony counts. Prior to the verdict, Balfour had been accused of submitting false expense reports. Balfour told senators he was humbled by the experience and the effect it’s had on him and his family was unimaginable. He also thanked those who supported him. Balfour did not give names but went on to scold those he blames for his ordeal. Prior to speaking on the Senate floor, Balfour told reporters forgiveness is an important but difficult concept at this point. After his remarks, Balfour received a standing ovation from a large number of Senators. But sources inside the Capitol say at least one member of Balfour’s own party wants to censure him and has approached Democrats about the possibility. Senator Josh McKoon worked at his desk as many other members stood for Balfour. McKoon said he’s not currently planning any action in regards to Balfour, but he left the door open for the possibility. However, McKoon did not comment directly on Balfour’s remarks saying he wants to take time to review them. Censure is a less harsh punishment than expulsion and requires a 2/3 vote of the Georgia Senate.